High-Tech Hydroponic Farm Transforms Abandoned Bowling Alley | Wired Science | Wired.com. NEW YORK CITY — On top of an old bowling alley in industrial northern Brooklyn sits an expansive translucent greenhouse. 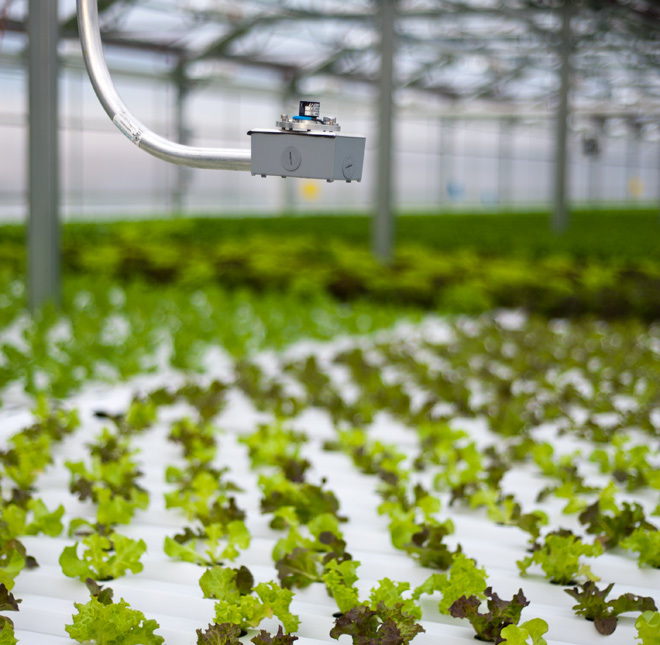 Inside, a bounty of produce thrives under the supervision of a computer-controlled network of sensors, motors and plumbing. 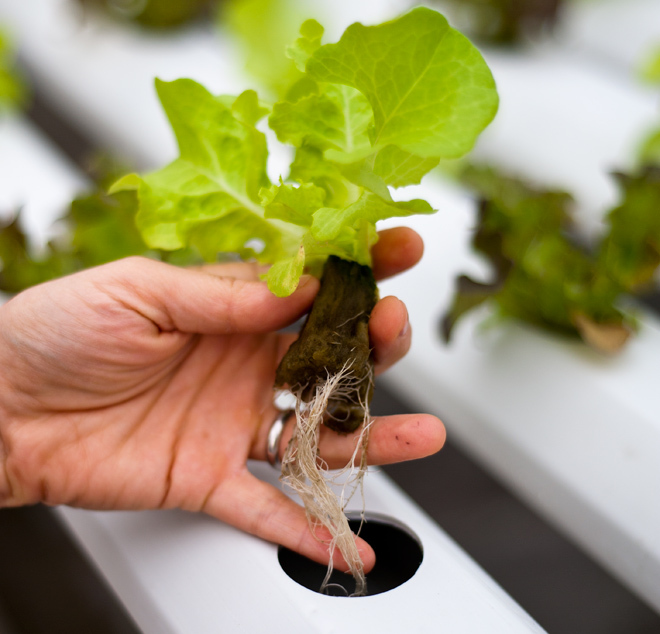 The 15,000-square-foot hydroponic greenhouse facility, called Gotham Greens, is reputedly the first commercial-scale urban operation of its kind in the United States. 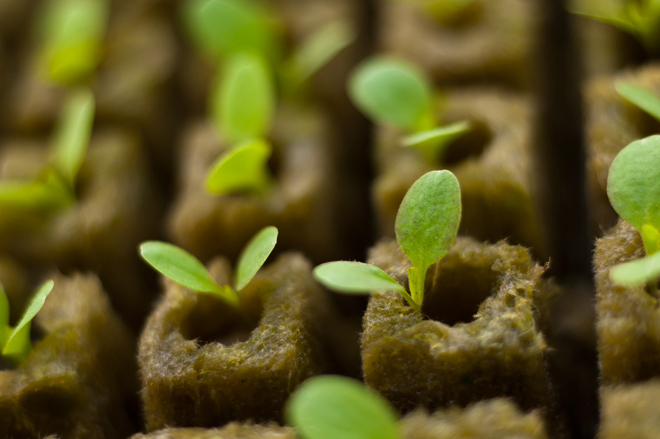 Thousands of lettuce and basil seedlings were plopped into a soil-less farming system in May. Since then, three local entrepreneurs say their operation is on track to deliver 100 tons of produce by the one-year mark. While that pales in comparison to about 1.5 million tons of soil-free produce trucked into the city each year, and is far less than the output of nearby soil rooftop farms, the $2 million startup can’t keep up with demand from the city’s top chefs and upscale grocery stores. “On the first harvest day we had so much lettuce we almost didn’t know what to do with it all, but now we can’t grow it fast enough,” said greenhouse director Jennifer Nelkin. 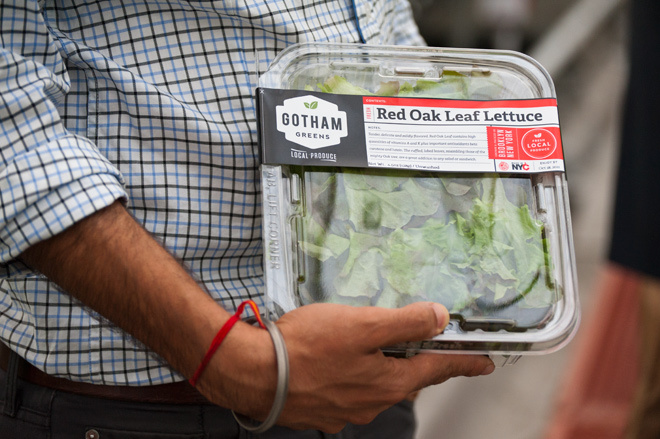 Gotham Greens is already eyeing some of the the city’s more than 940 million square feet of rooftop space to expand their high-tech operation. The hardest task, said co-founder and CEO Viraj Puri, is convincing landlords to entertain the idea of putting a watery business on their rooftops. After that it’s a matter of navigating zoning restrictions, building codes and figuring out how to engineer the plumbing. The greenhouse begins its work by germinating seeds of four lettuce types and one basil variety in plastic bins. Fibrous plugs, spun from a volcanic rock called basalt, draw water to the fledgling roots and provide a medium for them to grow in. 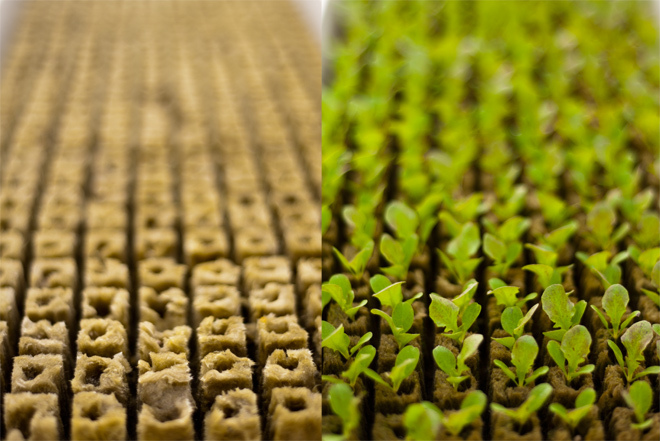 Between 10 and 14 days after planting in the basalt plugs (above), the seeds sprout into seedlings and are ushered into hydroponic gutters (below). A series of pumps and drains constantly move nutrient-rich water through the gutters. Gotham Greens uses the nutrient film technique, which circulates a very shallow layer of water to supply roots with ample oxygen. Tight control over the nutrients and climate gives growers extreme control over their products. Plants primarily need water, carbon dioxide, oxygen, nitrogen, phosphorus and sulfur to grow. Most of these materials come from air and tap water, but some trace nutrients need to be supplemented. Gotham Greens stores nutrient mixes in giant buckets (above). When low levels are detected by sensors or in human-collected samples, computer-controlled pumps move the fluid into a nearby lagoon. (For proprietary reasons, Wired.com was only allowed to photograph this part of the system.) From there the solution is delivered to the gutters, and runoff returns to the lagoon for recycling. The irrigation system is less complex than those of other hydroponic greenhouses, but Nelkin said anything more would be cost-prohibitive. 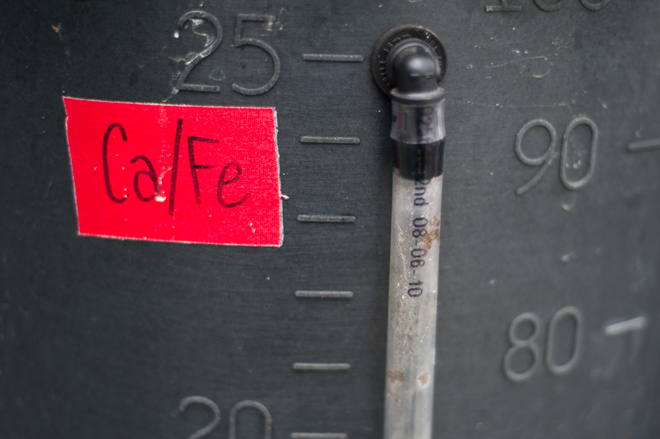 “For our scale, it doesn’t make practical sense to micromanage every nutrient,” she said. “We’re not that large.” Their water comes from the tap. 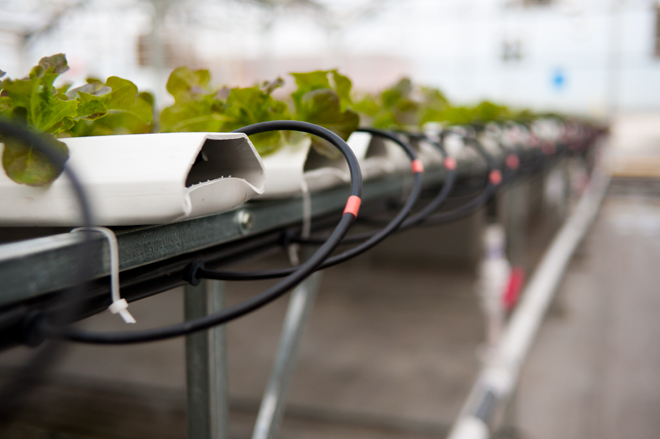 Important to Gotham Greens’ farming efficiency is a computer controller that monitors environmental conditions, keeping the greenhouse climate as ideal as possible for each type of veggie. 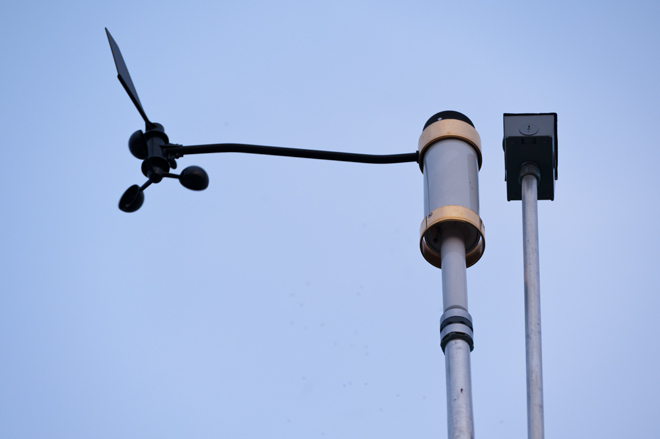 A weather station (above) monitors outdoor conditions while a photometer (below) and other sensors help keep tabs inside. “When it hits a certain climate, [the controller] can turn on the fans, draw the sun shades, open vents, turn on the lights, turn on the heaters and so on,” Nelkin said. But what of the pests found in abundance near any unprotected plant? Gotham Greens doesn’t use pesticides. They fight fire with bug-eating fire. 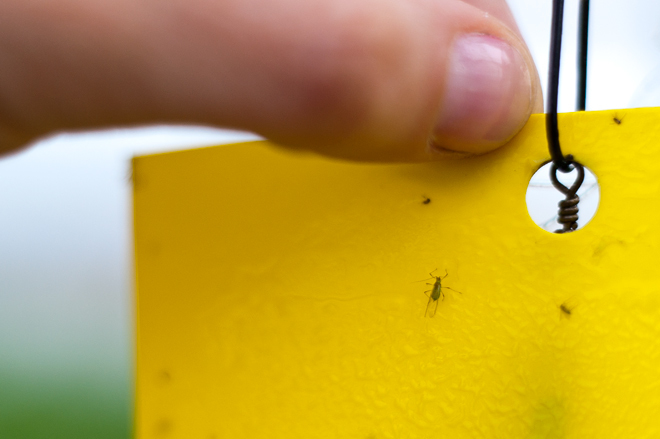 Colored plastic cards covered with sticky goo attract the pests, which Nelkin and others check each day. When a bothersome bug is identified, Nelkin shops online for its predator, orders it and releases hordes of them in the greenhouse. For aphids (above), a tray of ladybugs (below) usually does the trick. Controlling other pests requires the introduction of predatory wasps. Intelligent, organic greenhouses require electricity for lamps, pumps, computers and more. 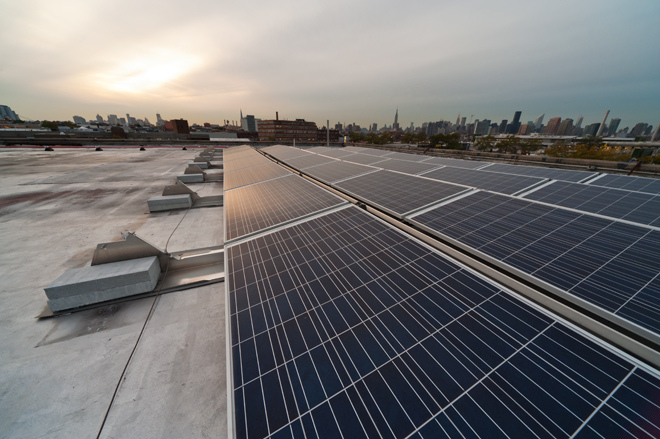 Solar panels installed by Gotham Greens satisfy about half of the facility’s needs, roughly enough to power 12 New York City households. 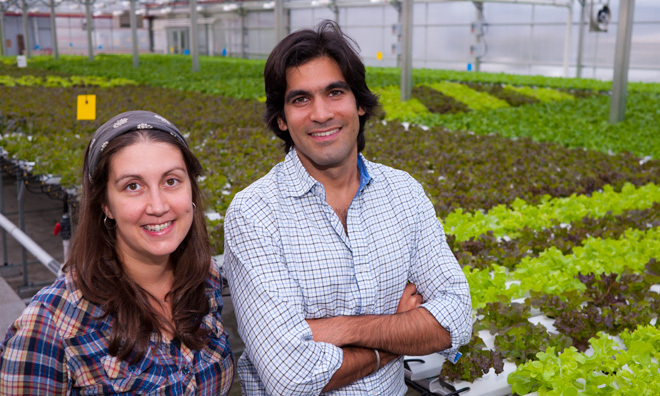 Jennifer Nelkin (above, left) and Viraj Puri dreamed up Gotham Greens in 2008 after collaborating on a greenhouse that floated on the Hudson River. They’re now spending 100 percent of their time to develop Gotham Greens along with co-founder Eric Haley. Their local food business may cut back carbon emissions better than most farms by minimizing transportation and relying on solar energy, but Puri said their main focus is delivering good produce. “The green aspects are a great bonus, but we want to be known for the quality of our products,” he said. 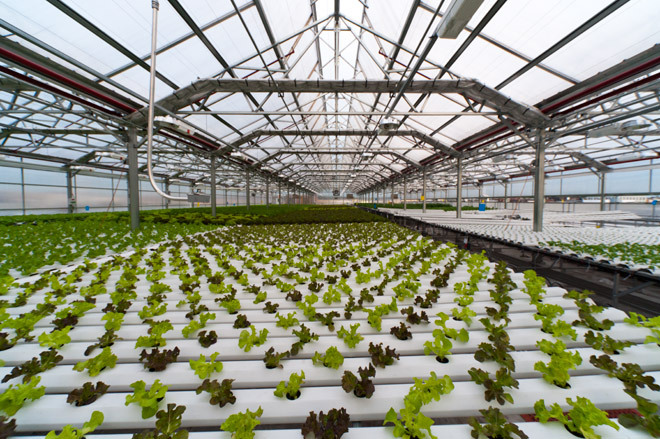 After Gotham Greens’ trial year ends in 2012, the company hopes to expand its line of crops to include tomatoes, cucumbers, peppers, squash, strawberries and even eggplant. Worst Food Additive Ever? It’s in Half of All Foods We Eat and Its Production Destroys Rainforests and Enslaves Children | Food | AlterNet. Sign up to stay up to date on the latest Food headlines via email. Indonesia, for the record, voted in favor of the Declaration on the Rights of Indigenous Peoples in 2007. Yet the government routinely sells indigenous peoples’ ancestral land to corporations. Often the land sold is Indonesia’s lowland rainforest, a biologically rich area home to endangered species like the orangutan, Asian elephant, Sumatran rhinoceros, Sumatran tiger, and the plant Rafflesia arnoldii, which produces the world’s largest flower. At stake are not only endangered species and human lives, but carbon emissions. One of the ecosystems at risk is Indonesia’s peat swamps, where soil contains an astounding 65 percent organic matter. (Most soils contain only two to 10 percent organic matter.) Laurel Sutherlin of Rainforest Action Network describes the draining and often burning of these peat swamps as “a carbon bomb.” Destruction of its peat swamps as well as its rainforests makes Indonesia the world’s third largest carbon emitter after the U.S. and China. Major river basins have enough water to sustainably double food production in the coming decades. ScienceDaily (Sep. 25, 2011) — While water-related conflicts and shortages abound throughout the rapidly changing societies of Africa, Asia and Latin America, there is clearly sufficient water to sustain food, energy, industrial and environmental needs during the 21st century, according to two special issues of the peer-reviewed journal, Water International (Volume 35, Issue 5 and Volume 36, Issue 1), released September 26 at the XIV World Water Congress. The report from the Challenge Program on Water and Food (CPWF) of the CGIAR finds that the “sleeping giant” of water challenges is not scarcity, but the inefficient use and inequitable distribution of the massive amounts of water that flow through the breadbaskets of key river basins such as the Nile, Ganges, Andes, Yellow, Niger and Volta. “Huge volumes of rainwater are lost or never used,” he added, “particularly in the rain-fed regions of sub-Saharan Africa. With modest improvements, we can generate two to three times more food than we are producing today. While Africa has the biggest potential to increase food production, researchers identified large areas of arable land in Asia and Latin America where production is at least 10 percent below its potential. For example, in the Indus and Ganges, researchers found 23 percent of rice systems are producing about half of what they could sustainably yield. The analysis — which involved five years of research by scientists in 30 countries around the world — is the most comprehensive effort to date to assess how, over vast regions, human societies are coping with the growing need for water to nurture crops and pastures, generate electricity, quench the thirst of rapidly growing urban centers, and sustain our environment. The findings also present a picture of the increasingly political role of water management in addressing these competing needs, especially in dealing with the most pressing problem facing humanity today: doubling food production in the developing world to feed a surging population, which, globally, is expected to expand from seven to 9.5 billion people by 2050. The 10 river basins that were studied include: the Andes and São Francisco in South America; the Limpopo, Niger, Nile and Volta basins in Africa; and the Ganges, Indus, Karkheh, Mekong, and Yellow in Asia. The basins — distinct and gargantuan geographic areas defined by water flows from high-ground to streams that feed major river systems — cover 13.5 million square kilometers and are home to some 1.5 billion people, 470 million of whom are amongst the world’s poorest. “The most surprising finding is that despite all of the pressures facing our basins today, there are relatively straightforward opportunities to satisfy our development needs and alleviate poverty for millions of people without exhausting our most precious natural resource,” said Dr. Simon Cook, of the International Center for Tropical Agriculture (CIAT) and Leader of the CPWF’s Basin Focal Research Project (BFRP). For example, Cook and his colleagues found that if donors and government ministries put more emphasis on supporting rain-fed agriculture, food production can increase substantially and rapidly. In Africa, it was found that the vast majority of cropland is rainfed and researchers found that only about four percent of available water is captured for crops and livestock. “With a major push to intensify rainfed agriculture, we could feed the world without increasing the strain on river basins systems,” said Cook. The authors also note that boosting food production in the basins studied requires looking beyond crops to consider more efficient uses of water to improve livestock operations and fisheries. Water policies often ignore the role livestock and fish play in local livelihoods and diets. For example, the researchers found that in the Niger basin, freshwater fisheries support 900,000 people while 40 million people in the Mekong depend on fisheries for at least part of the year. In the Nile, researchers note that almost half of the water in the basin flows through livestock systems. “The basin perspective is critical in order to assess the upstream and downstream impacts of water allocation policies, and to determine opportunities for optimizing the sum of benefits across many residents,” said Dennis Wichelns, Deputy Director General at the International Water Management Institute (IWMI), which was a major partner in the research. The researchers contrast the poor use of water resources within river basins observed in many areas — which they refer to as “dead spots” for agriculture development — to “bright spots” of water efficiency. They said bright spots can be found in the large areas of the Ganges, Nile and Yellow River basins, where farmers and governments have responded to development challenges by vastly improving the amount of food produced from available water. They also single out “hot spots” — which can be found in the in the Indus, Yellow, Nile and Limpopo river basins — where there is mounting concern and conflict over sharing water resources and reaching consensus on development approaches. “In many cases, we need a complete rethink of how government ministries take advantage of the range of benefits coming from river basins, rather than focusing on one sector such as hydropower, irrigation or industry,” the authors stated. 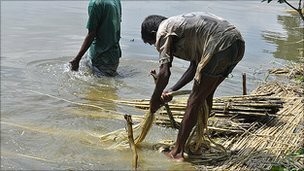 BBC News – Bangladesh’s ‘golden fibre’ comes back from the brink. 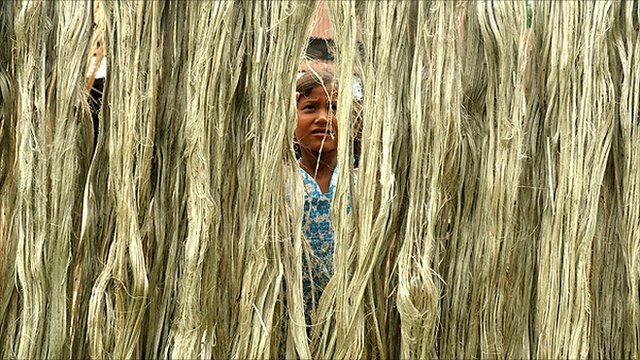 Jute, a vegetable fibre that can be spun into sackcloth, used to be the ‘golden fibre’ of Bangladesh. It brought much-needed foreign income to the impoverished nation. But it lost its lustre in the 1980s after synthetic materials like polythene and plastics were introduced. Now the natural fibre has made a spectacular comeback. 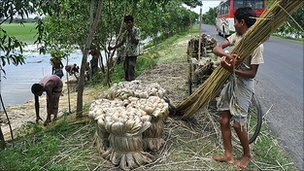 Exports of jute and jute products from Bangladesh this fiscal year crossed a record billion dollars as demand for the natural fibre is steadily increasing. With growing environmental awareness, jute, which is bio-degradable, has become the preferred alternative to polluting synthetic bags. Jute is considered to be the second most important natural fibre after cotton in terms of cultivation and usage. It is mainly grown in eastern India, Bangladesh, China and Burma. Until recently the fibre was used mostly as a packaging material. With a diversification of jute products, the demand for jute has increased. 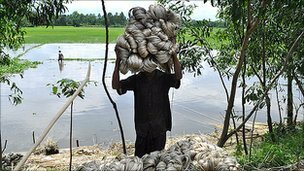 “By processing the fibre mechanically and by treating it chemically, now jute can be used to make bags, carpets, textiles and even as insulation material,” says Mohammad Asaduzzaman, a scientist at the Bangladesh Jute Research Institute in Dhaka. When synthetics like polythene bags came into widespread use, the demand for jute declined and many jute mills in countries like Bangladesh were shut down. Thousands lost their jobs and farmers shifted from jute to more profitable rice cultivation. Today, as demand increases, more farmers are returning to this traditional crop. 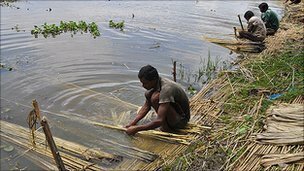 It is estimated that nearly five million farmers are involved in jute plant cultivation in Bangladesh. It plays a key supportive role to the rural economy of Bangladesh. Once the jute plants are harvested they are bundled together and immersed in running water and allowed to rot. Then the fibres are stripped from the plant. The stripped fibre is dried and later sent to mills for processing. 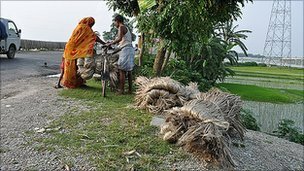 Golam Moazzam, a research fellow at the Centre for Policy Dialogue, in Dhaka says: “It is important to note that policy support also contributed to its widespread use of jute both locally and internationally. Jute is also versatile, strong and long-lasting and scientists say they are discovering more uses for it in different sectors. For example, Geotextiles, a diversified jute product, is used for soil-erosion control and also used in laying roads to give more durability. The natural fibre is also used to make pulp and paper. Bangladeshi scientists are now working on an ambitious project to blend jute fabric with cotton to produce denim fabric. They say if the jute plant is harvested earlier than the usual period of 120 days, then it gives a softer fabric. If this process can be commercialised, he says, it will bring down the demand for cotton, which is also becoming dearer day by day. The price of fabric can be reduced by a half, bringing benefits to the country’s garment sector. Special machines are required to blend this fibre with cotton and they are yet to be produced commercially. Scientists hope spinning factories will be able to install these machines in the near future. “Unfortunately, there is not much research going on in terms promoting diversified jute products,” says Mr Moazzam. Bold Solutions Make Real Cities More Efficient [Interactive]: Scientific American. A Plan to Power 100 Percent of the Planet with Renewables: Scientific American. 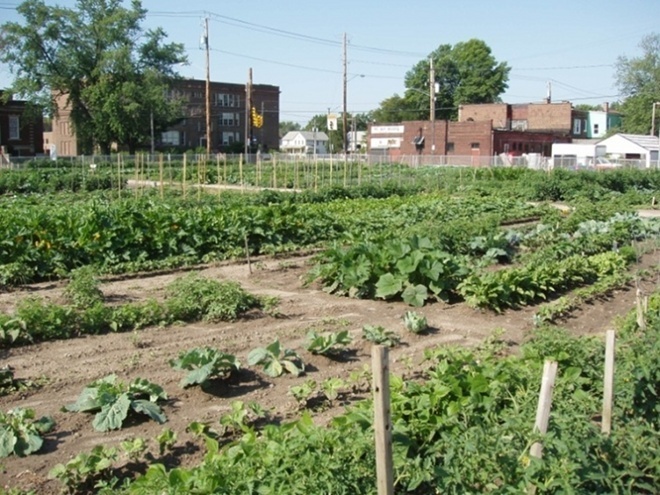 Can Planting Vegetables in Vacant Lots Save Cleveland? Can Planting Vegetables in Vacant Lots Save Cleveland? | Wired Science | Wired.com. Backyard vegetables can fight crime, improve health, and boost the economy. By transforming its vacant lots, backyards and roof-tops into farming plots, the city of Cleveland could meet all of its fresh produce, poultry and honey needs, calculate economists from Ohio State University. These steps would save up to $155 million annually, boost employment and scale back obesity. “Post-industrial cities like Cleveland are struggling with more and more unused land, these become sources of crime,” said Parwinder Grewal co-author of a study “Can cities become self-reliant in food?” published July 20 in Cities. Urban gardening improves health, reduces pollution, and creates local businesses, Grewal said. The population of Cleveland, what Grewal considers a typical post-industrial city, peaked near one million in 1950, and has been declining since. Today scarcely half a million people call Cleveland home. As industrial jobs have dried up, the city’s exodus has accelerated. Unable to keep up their properties, many former residents have abandoned their homes. Vacant lots are proliferating, and currently number more than 20,000, according to the Cleveland City Planning Commission. Ten percent of Clevelanders have been diagnosed with diabetes, as compared to the national average of 8 percent, and more than a third are obese. Among cities with a population between 100,000 and 500,000, it is the seventh most dangerous, according to one crime ranking. Growing tomatoes and beans, and keeping bees and chickens, would change all this, Grewal said. Studies have shown that gardens improve community health, reduce crime and increase property values. Cleveland city planners have placed special emphasis on programs to foster urban gardening in the past five to 10 years, however, Grewal’s visions are on a more ambitious scale. In the most intensive scenario he outlines 80 percent of all vacant lots, 62 percent of business rooftops, and 9 percent of residential lots would be tied to food, allowing the city to meet up to 100 percent of its fresh food needs. 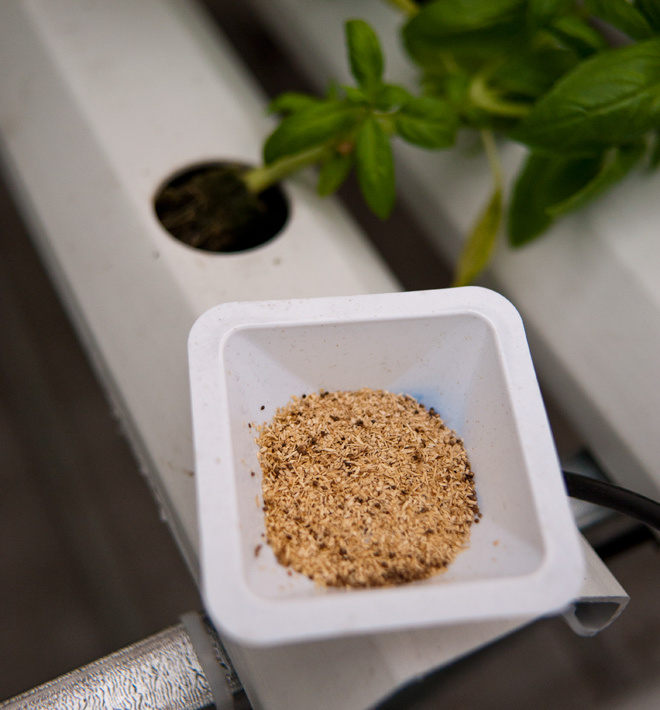 Grewal, who grows the bulk of his own food in his backyard, believes that his propositions are realistic and practical. The largest barrier is convincing citizens to garden. While Cleveland might have enough land to be self-sufficient, it doesn’t yet have the labor force to make it happen, Scott said. Both Scott and Grewal hope that shift is coming. Cleveland now has hundreds of community gardens. Some residents are growing market gardens, cultivating and selling produce as a full-time job. The city is seeing the grandest show of large public gardens since the Victory Gardens of World War II, when 40 percent of U.S. vegetables came from private and public gardens. Poorer Nations Lead Global Movement Toward Low Carbon Energy: Scientific American. Poor countries have spent just as much as rich ones — and in the case of China, more — to develop low-carbon energy, according to a study coming out this week. Its conclusions could turn the conventional wisdom about the differences among nations over mitigation efforts on its head. The report by former World Bank economist David Wheeler, who now leads the climate change division at the think tank Center for Global Development, finds that China spent 94 cents of every $10,000 of average income on clean energy between 1990 and 2008. The United States, by contrast, spent 44 cents of every $10,000. Meanwhile, all other industrialized countries combined spent only a penny more per year than their less developed counterparts. “We all had this idea that [climate change] was a rich country problem and that poor countries shouldn’t have to do anything until they get to a certain stage of development, and that rich countries need to make it worth their while. But what I had seen suggested [was] that poor countries were already doing a lot,” Wheeler said. The data bore that out. Wheeler examined International Energy Agency data for 174 countries on investments in six low-carbon power sources (hydro, geothermal, nuclear, biomass, wind and solar) to find the incremental costs of clean power compared to a cheaper, carbon-intensive option like a conventional coal-fired power plant. He then computed the average income share in countries to compare how much people in poor countries are paying for carbon mitigation compared to those in rich nations. “Lo and behold, you get a world in which the shares that poor countries have been devoting to low-carbon technologies over the past 18 years is really comparable to the rich countries,” Wheeler said. The study comes as countries continue to debate whether to develop a new international climate change treaty. Developing countries, which currently are not obligated to curb emissions, have long argued that they should not be required to help solve a problem caused by industrialized nations. Many maintain that they also have “atmospheric rights” — that is, the right to pollute — in order to develop. Wealthy countries, meanwhile, argue that fast-growing developing countries like China and India are not doing enough to mitigate emissions. U.S. lawmakers in particular have argued that cutting carbon would put America at a competitive disadvantage to China. But the fact is, countries are working steadily to develop clean energy. And, Wheeler’s study argues, they’ve been doing so for a long time. Since 1990, developing countries have accounted for 55 percent of the global increase in low-carbon energy generation, he found. China accounted for 15 percent of it alone. In fact, because of the growth of hydroelectric generation in particular, developing nations like the Kyrgyz Republic, Bhutan, Mozambique, Paraguay and Zimbabwe crowd out the few top-spending developed countries like Iceland, Germany and Finland. Tajikistan actually tops the list, spending $12.27 for the incremental costs of clean energy for every $10,000. But Wheeler noted that might be an anomaly because the country underwent a civil war. A push in hydro development in 1992-1993 might have been a restart of war-idled energy capacity rather than new development, he noted. Iceland is the only high-income country in the top 10 list. With a gross domestic product per capita of $29,752, the country spends $11.56 per person annually — mostly on geothermal power. But the Kyrgyz Republic, with a per capita GDP of just $1,634, has spent only slightly less — $11.22 per person. Wheeler said he purposely included the controversial energy sources hydro and nuclear. While environmental groups fighting for action on climate change don’t like to include those options, Wheeler said he felt it was important to look simply at what sources produce low or zero emissions. At the same time, he argued, despite the safety risks and environmental hazards posed by nuclear and large hydro, respectively, the climate would be in far worse condition had countries not developed those sources. “They’re a huge part of this story,” Wheeler said. “If poor countries hadn’t gone down that road, our carbon emissions would be now far higher than they are, and it would be growing every day much worse than it is.” He also didn’t try to tease out a country’s motive for developing low-carbon energy, since in virtually every case, it had little or nothing to do with climate change. Derek Scissors, a research fellow in the Asian Studies Center at the Heritage Foundation, questioned whether looking at the past decades is a useful comparison, particularly for hydro development, since industrialized countries like the United States built their dams decades ago. But he also objected to thinking about the climate debate, or the spending necessary to reduce emissions, in terms of developed versus developing countries. Rather, he said, the discussion should be among major emitters of the past, present and future. Wheeler said he also thinks the equity argument needs to be put to rest, but that countries like the United States need to realize that long-held arguments that China is not doing enough to mitigate greenhouse gas emissions don’t hold water. He noted that the 94 cents per $10,000 average income that China spent compared to America’s 44 cents looks like an even wider gap when the income is factored in. China’s average GDP per capita for that time period was $2,860, while the United States’ was $37,640. “What I see is, I have a really rich country that seems to be spending less than 20 percent per unit of income that what China is spending. There’s no possible way I can judge that as reasonable,” Wheeler said. * Countries’ spending on low or zero-carbon energy (hydro, geothermal, nuclear, biomass, wind and solar) from 1996 to 2008, calculated as a share of their average income.